I like this game a lot. There is nothing this game doesn’t have. However, I have the newest iPad and, unlike Toca Life World, this app has not been adjusted to fit the new iPad’s aspect ratio. I would really appreciate it if this app was adjusted. most definitely not worth the money. while the game is kinda fun, you pay about $4 for nothing. the game has little to do and is quite hard to work. I want my money back! 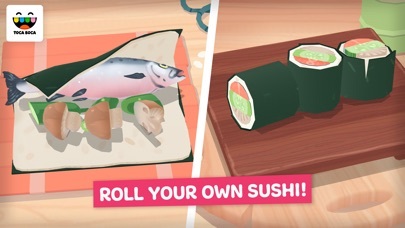 I personally love Toca Kitchen Sushi but I wish there was other things like something that you could add. I really want some kinda drink making station cause that would be really cool. 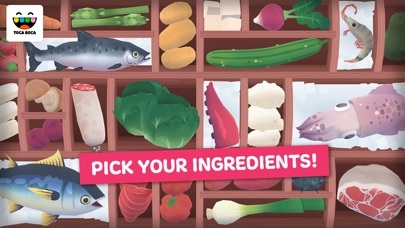 This game also doesn’t have enough ingredients cause I want more kinds of fish and other foods. I wish it was easier to chop food cause when I try to chop or slice something it makes me pick it up or slice the wrong spots. Also, there isn’t a lot of characters cause there is only three, cmon Toca you can do better than that. 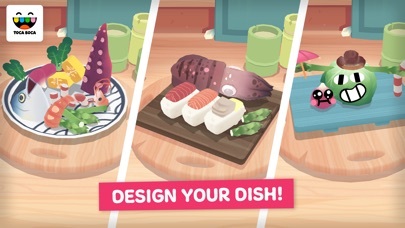 I wish you could also choose your character to serve food to cause it just does a pattern and I don’t like it. 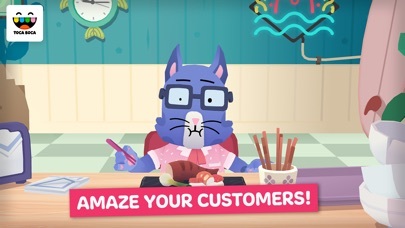 Also I want the restaurant to serve soup, I know it’s kinda crazy cause your probably thinking: “Why would they want soup, this is a sushi restaurant.” But it would be much more cooler. From, A random person on the internet. I LOVE you Toca Boca!!!!! I’ve been playing all of the games for three years and counting. And I have an update request, add tea making. Traditionally tea is served with the dish. So kinda curious if you guys would do that!:):):)::):):):)! My 6 1/2 year old grandson loves it. Couldn't put it down. A big success. 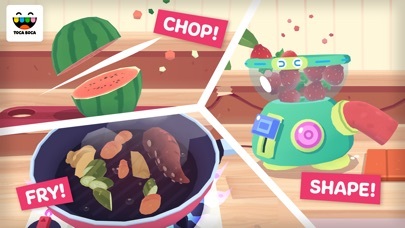 My and my little sister love playing this together, it’s really fun but I feel like it would be even better if you could make drinks like tea as well. Other than that, good game!